Not all property qualifies for tax deferral under Section 1031. 121 of the tax code provides a total exclusion of gain from the sale of a primary resident up to $500,000 for a married couple ($250,000 for a single person) if you have lived in the home for at least two out of the last five years. No intermediary or other documentation is required to qualify under Section 121. The only requirement is the filing of the appropriate tax form. There is no requirement of re-investment of proceeds in another home and the exclusion is available every two years. Property held for re-sale is disqualified. If a taxpayer is in the business of constructing and selling home, for instance, the homes are inventory and not qualified. This provision also disqualifies investors who purchase and re-hab run down properties for re-sale. 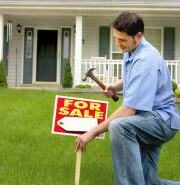 If property is acquired for the re-sale rather than to hold for investment, it is not qualified property. Stock in corporations and partnership interests are specifically disqualified from tax deferral under Section 1031.